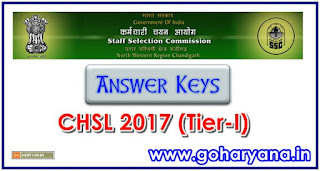 Staff Selection Commission has declared the result of Combined Higher Secondary Level Examination 2017 (Tier-I) on 15.06.2018 which was uploaded on the website of the Commission on dated: 15.06.2018. the Commission has uploaded the Final Answer Keys along with Question Paper(s) on the website of the Commission on 27.06.2018. The candidates may take a print out of their respective Question Paper(s) along with the Final Answer Keys by using the link given below. This facility will be available for the candidates for a period of one month i.e. upto 26.07.2018.